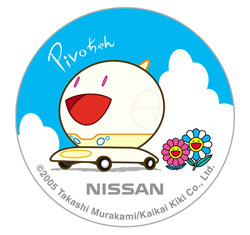 TOKYO (Sept. 30, 2005) - Nissan Motor Co., Ltd., today unveiled Pivo, its imaginative electric car concept, in partnership with renowned Japanese artist Takashi Murakami at the company's Nissan Ginza Gallery in downtown Tokyo. Pivo, which will be on display at this year's Tokyo Motor Show, features an innovative cabin that revolves 360 degrees, eliminating the need to reverse. 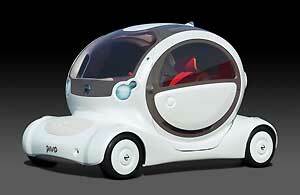 Thanks to its compact body, the car is also exceptionally easy to maneuver. The three-seater car comes with a number of user-friendly technologies, including Nissan's Around View Monitor which reduces blind spots by displaying the outside surroundings on screens mounted on the inside of the car's A-pillars located on either side of the windshield. A dash-mounted infrared (IR) commander allows the driver to operate the navigation and stereo systems with simple finger movements without letting go of the steering wheel. Pivo is powered by Nissan's compact, high-performance lithium-ion battery and its unique Super Motor, resulting in zero emissions. The gallery space for the Pivo event, which was designed by Murakami, features a futuristic vegetable garden installation, as well as large balloons and illustrations of "Pivo-chan," a character he designed based on the concept car's inspiring image. Previously, Murakami has collaborated with Louis Vuitton and Roppongi Hills. I am always fascinated to see the way he and his cohorts play around with the boundaries between pop culture, high art, and consumer desire. Also, there's the interesting phenomenon of cute characters being used to market products that are not intended for children. 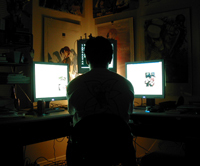 Furthermore, this is another example of the otaku-related trend of technology being anthropomorphized. What happened to anime "shrines" on the web?